Hi guys to day im been learning about a disk brake it took me a week for all of this. Disc brake is two pads squeeze the wheel to make it stop. The district works a lot like breaks for a car. It also pushed onto the rotor stopping the bike. Disk brakes can be on a car. Plus it can go on a tractor. If you don't have disk brakes your car won't work. So that's why you need disk brakes on a car. So that´s how disk brakes work. So also the main bit will be the hub because it is the main bit and the rotor is skinny plus so there are also to screws. Thats attached to a little circle. Also there is the brake pads to help the disk brakes so that it won't get jammed so that's why you need the pads and disk brakes are interesting brakes because they're different to a normal brake disk brakes are so cool. I like disk brakes because of the movement of it. I want to look at a car disk brake compare to a motor bike disk brake you probably see a difference. So that's also why i like disk brakes. So it took a week to do this. Hi Dani, It's Mrs Pam. I like how you have created a diagram to show how disk brakes work. It is also interesting to know that you find disk brakes on cars and tractors as well as motor bikes. Does your family car have disk brakes? Hey Dani, this is such an interesting and factual post. 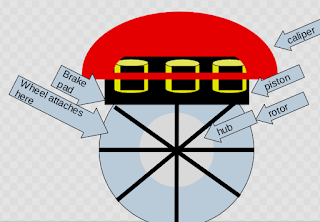 I like all of the ideas you have shared and your drawing of a disk brake. It would be very interesting to compare a car disk brake and a motor bike one. I wonder what the difference would be? Maybe you could ask an expert and let me know? I like how you did a lot of writing!